Sub: School Education - CCE Marks Entry for Class V - SA l Examination of Academic Year 2017-18 -Instructions to MEOs and School Head Masters - Reg. All the Regional Joint Directors of School Education and District Educational Officers in the State are informed that the online screen for uploading SA I marks of Academic Year 2017-18 is enabled and available for uploading of marks. Data entry for Class V students is mandatory for AY 2017-18. The link to CCE marks entry is available on the website of Commissionerate of School Education (www.cse.ap.gov.in). 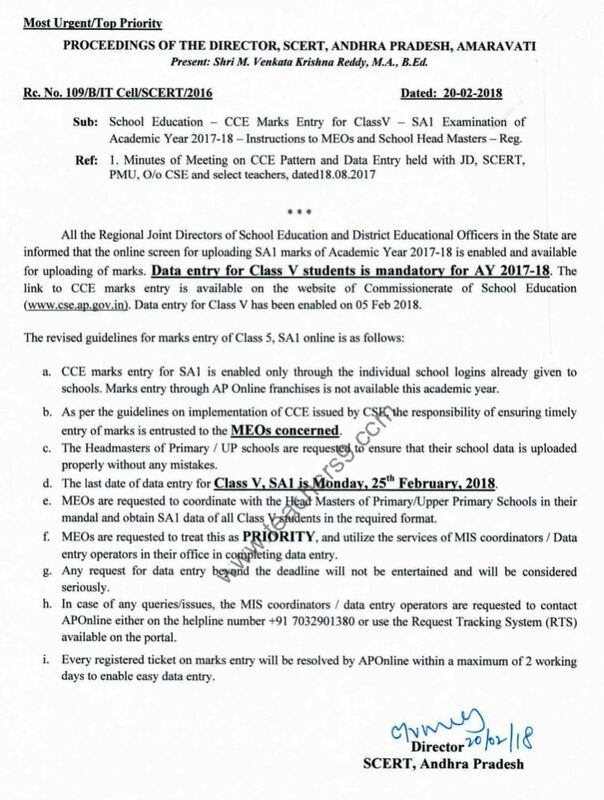 Data entry for Class V has been enabled on OS Feb 2018. CCE marks entry for SAl is enabled only through the individual school logins already given to schools. Marks entry through AP Online franchises is not available this academic year. As per the guidelines on implementation of CCE issued by CSE, the responsibility of ensuring timely entry of marks is entrusted to the MEOs concerned. The Headmasters of Primary / UP schools are requested to ensure that their school data is uploaded properly without any mistakes. The last date of data entry for Class V, SAl is Monday, 25th February, 2018. 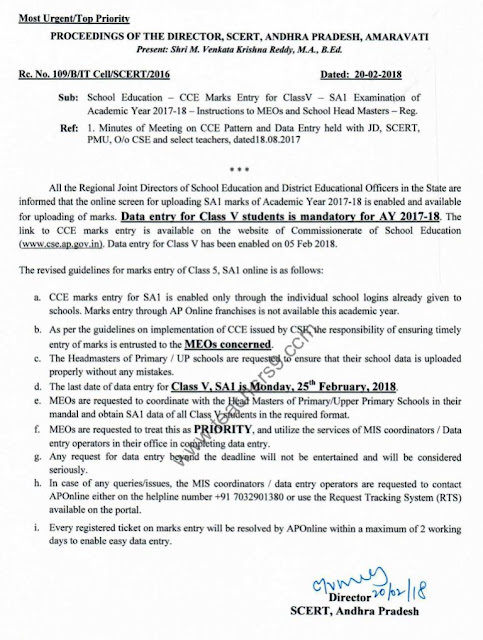 MEOs are requested to coordinate with the Head Masters of Primary/Upper Primary Schools in their mandal and obtain SA I data of all Class V students in the required format. MEOs are requested to treat this as PRIORITY, and utilize the services of MIS coordinators / Data entry operators in their office in completing data entry. In case of any queries/issues, the MIS coordinators / data entry operators are requested to contact APOnline either on the helpline number +91 7032901380 or use the Request Tracking System (RTS) available on the portal. Every registered ticket on marks entry will be resolved by APOnline within a maximum of2 working days to enable easy data entry.